Many hydroponics growers will tell you that "Air Flow is everything." A vital part of the hydroponic growing is airflow and exchange. Proper air flow means your plants can breath in CO2 and move the O2 (oxygen) it created out from the growing area. If you are gardening in a basement or confined space, this exchange can be achieved by creating a vacuum that will pull out the old air and draw in the new air. The objective is to produce consistent air movement. Plants need fresh air circulation to live. If you are growing in a confined space you must circulate fresh air into your growing area. This air flow will naturally supply CO2 to your plant. Make sure that you choose an air flow and CO2 system that best fits the area that you are growing in. 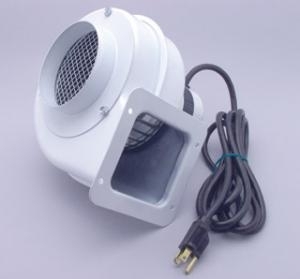 Often used for circulation are ActiveAir blowers or Can Fans. Lack of fresh air in a confined growing space is a common problem experienced by indoor growers, and proper air supply and air-flow are necessary. Buy hydroponics supplies for these items and more. Controlling heat in the grow room is very important. The least expensive way of reducing the heat in the grow room is to vent out the heat and replace it with cooler air. If you're in a confined area or basement then the air would need to be pulled in from the outside or after it is artificially cooled. it’s best to draw cool air from outside. A blower can be used to help control temperature. A differencial thermostat can can be used to turn on and off a blower at varied degrees to make the process more effiecient. An alternative to moving all the air out is to capture the heated air and vent it. This can be done with an air cooled grow light. The advantage with this setup is that you’re using less energy to move the heat out. Visit Beste's online hydroponics supply store or call our retail garden and growing center at (586)776-1794 for all the hydroponic growing supplies you'll need.